So Halloween finally came around. As I mentioned in my previous post I ran out of time for pre-halloween crafting (so much for the sugar skull wall hangings I had planned for my Rescued Rags shop!). However, I did manage to put together a homemade/vintage halloween party! I always go slightly crazy on the halloween baking front, which has become a bit of a tradition. As we were having a party this year I went a little cupcake mad! Bloody Brain cupcakes (from the Lilli Vanilli cookbook used for the Vampire Bite cupcakes). I was a little bit dubious about how good these would look as Ive never really attempted piping icing before, but I was very happy with the end result. They also went down a storm with party guests. Chocolate Graveyard cakes with gingerbread tombstones (again, Lilli Vanilli) but with my own take on chocolate frosting, replacing fancy American frosting with good old fashioned chocolate buttercream. 'Ghost Cakes' - one of my housemates at uni used to make these, and they have become part of the halloween baking tradition. Really easy fondant sheets and a few blobs of black piping icing. I also managed to make my costume this year. Halloween has always been a bit of an inspiration for me and an opportunity for me to dress up like an idiot. 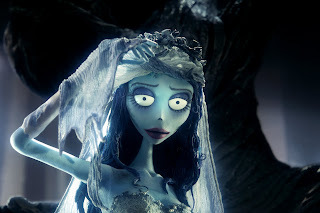 Previous years have seen Poison Ivy, Warhammer Orks and Zombie Morrisey, but this year I opted for the Corpse Bride. In my terms this was a pretty last minute choice (I usually start planning months in advance) but I think I managed to pull it off pretty well, despite having to explain to several trick or treaters that I wasn't in fact a smurf! The dress is a vintage shop find which I managed to get for £10! Such a gorgeous 1950s shape, but sadly not quite big enough to zip up all the way at the back. With the help of my equally crafty mother, I added an extra panel to the back to make it fit. I also added some darts in the skirt to lift it up in places to show the net underneath(I have been dead after all!). I also added some beige lace around the neckline to make it a little more like the corpse bride's dress. The veil was made from scratch, using a pound world alice band and 2 vintage scarves with fabric flowers to disguise the stitching. Add on some blue tights/sleeves and some blue facepaint and I was good to go! I also dyed my hair blue for the occasion (cant stand wearing a wig for any length of time) but this may have been taking things a little too far!